NAGATIVE MESSAGING BRINGS FORTH NAGATIVE RESULTS. POSITIVE MESSAGING BRINGS FORTH POSITIVE RESULTS. Messages you continuously feed yourself, for good or for nil, gradually you come to believe to be true. Ruminating about past misfortunes, anticipating the worse occurring in our future, results in you’re more apt to exist day to day rather truly living in the here and now. Far too many people hold onto negative thoughts about themselves as truth. Yet they reject anything affirming about themselves as divorced from reality. The following are some suggestions that may be helpful to you if this is something you struggle with. To counteract thinking the worst will occur in some future, you can develop a “back up plan” beforehand that will help you cope should the worse materialize. Rather than being overwhelmed by all your perceived pressures, break each down to small objectives. 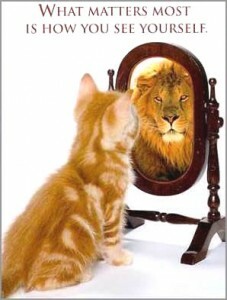 Once each small objective is achieved, it will act as a building block toward self affirmation. Think about how someone with a positive self esteem would act in a given situation and emulate the same behavior regardless of how you feel. Reframe from personally seeing yourself responsible for things that occur that are outside your control. Remember you are not the center of the universe. Things happen for many known and unknown reasons. Take responsibility for only for yourself and your own behavior. On the other hand, be aware of not making others responsible for your unhappiness. Giving them that power can make you think of yourself as a helpless victim. Others can open the door but it is your responsibility as to whether or not you walk through it. Be aware of not viewing feelings as facts. How you feel in any given situation does not define the reality of what you being are faced with. It also does not define who you are as a person. Remember to contact me, ray Shocki PhD, LCSW, LMFT with any questions or suggestions at lifesourcecenter@aol.com. This entry was posted in Changing habits that resist change, changing self deception by Shocki, PhD, LMFT, LCSW. Bookmark the permalink.